This invention deals with hard, curable, clear and pigmented release coatings for cookware and bakeware. For years, it was common in the commercial baking art to utilize natural fats, greases and vegetable oils for coating cookware to obtain release of the cooked goods from the cookware, but beginning with 1960, the commercial cooking industry, especially the baking industry, was introduced to polyorganosiloxanes as a means of obtaining release of foods and baked goods from the cookware. The release coating technology moved quickly as various curable, thus more durable, organopolysiloxanes were introduced to the industry. These more advanced release coatings usually consisted of hydroxy-containing fluids, which were usually linear polydimethylsiloxanes, dissolved in higher viscosity phenylmethylpolysiloxanes or, such linear materials were combined with solvent-based or solventless organopolysiloxane resins and cured onto certain substrates, by the application of heat, to cause condensation reactions. Other, more modern, release coatings utilizing siloxanes involved the combination of a linear, hydroxylated, diorganopolysiloxane, a phenylmethylpolysiloxane and an organopolysiloxane block copolymer which is heat cured onto the substrate. Such a coating is described in U.S. Patent No. 3,308,079 and cures through condensation reactions of the silanols present in the siloxane components. A similar release coating material is described in U.S. Patent No. 3,308,080, except that the phenylmethylpolysiloxane does not form part of the composition. In U.S. Patent No. 3,925,276 there is described a process for preparing a silanol-containing organopolysiloxane resin which is useful as a release resin. This type of resin is described as giving good release to sugar-containing baked goods. This type of resin, with a fairly specific ratio of alkyl and aryl siloxanes, cures by heat curing through condensation reactions. U.S. Patent No. 4,204,021 deals with a composite layer concept for release purposes wherein a first coating is applied to a porous ceramic layer and impregnates the porous ceramic layer. The top layer is a release layer and the patent describes organopolysiloxanes as part of a group of known release coatings wherein there is present in the organopolysiloxane, an unsaturated radical on silicon, which when combined with a photosensitizer, can be cured by a free radical light source. British Patent 1,448,985 describes pigmented release coatings that are obtained by a two coat composite method, in which, the bottom coat is.a cured pigmented coating and the top coat is a hard, transparent release coating. The hard, transparent release coating is generally described as a silicone resin that gives release. No additional information is given about the release coating which would enable one to ascertain its composition or cure mechanisms. These materials cure at room temperature in a very short period of time by reaction of the acetoxysilane with moisture in the air and subsequent condensation reactions under the influence of catalysts. Since the instant invention can be described in-part as an "air-dried" release coating, the US-A-3419514 reference is, in the applicants' opinion, the closest prior art. None of the other references are considered by the applicants to anticipate or to obviate the instant invention. Furthermore, even though the US-A-3419514 is considered pertinent prior art, it differs from the instant invention in at least the following manner: the crosslinking means of the instant invention consists of the inclusion of CH3Si(OCH3)3 in the composition. This alkoxy silane, upon hydrolysis, liberates non-corrosive methanol which is removed quickly during the cure reaction whereas the crosslinking means of this reference liberates acetic acid during the cure reaction. This acetic acid is both corrosive to metal substrates and is extremely difficult to remove during the cure reaction. Also, the essential base siloxane of the US-A-3419514 reference is a phenylmethylpolysiloxane whereas the essential base siloxane of the instant invention is a copolymer of four specific alkyl and/or aryl-containing siloxane units. Component (c) of the reference material is similar in composition to component (C) of the instant invention but the instant composition does not contain the organic polyether, component (b) of this reference. Therefore, even though the two inventions have a common ingredient, i.e., component (c) in each case, and even though they both claim to have air-dry properties, it is quite obvious that the comparison stops there and the material of the instant invention is not the same as the material of this reference. US-A-3,231,532 discloses an organopolysiloxane coating system useful for coating cooking utensils which comprises, by weight (1) 100 parts of a methylphenylpolysiloxane resin containing an average of from 1.1 to 1.5 total methyl and phenyl radicals per silicon atom with from about 30 to 70 percent of the total methyl and phenyl radicals being phenyl radicals, (2) from 0.5 to 6 parts of a methylphenylpolysiloxane fluid comprising principally dimethylsiloxane units and diphenylsiloxane units and having a viscosity of from about 5,000 to 500,00 centistokes when measured at 25°C. and containing an average of at least 2.0 total methyl and phenyl radicals per silicon atom with about 5.0% to 20.0% of the total methyl and phenyl radicals being phenyl radicals, (3) from about 0.01 to 0.1 part of a trimethylsilyl chain-stopped methylpolysiloxane fluid having a viscosity of from about 100 to 10,000 centistokes when measured at 25°C. and (4) up to about 6 parts of a methylphenylpolysiloxane fluid comprising principally dimethylsiloxane units and methylphenylsiloxane units and having a viscosity of from about 100 to 50,000 centistokes when measured at 25°C. and containing an average of at least 2.0 total methyl and phenyl radicals per silicon atom with from about 2.0 to 6.0 percent of the total methyl and phenyl radicals being phenyl radicals. The coating composition which is described is applied to the surface of a cooking utensil and cured by heating for 1 to 3 hours at 400 to 425°F. (204 to 218°C). DE-A-1,644,969 describes mould release agents which comprise at least 70 percent by weight of an organopolysiloxane containing a terminal alkyl group and at least about 3% of a partly alkoxylated silicone resin which contains at least about 4%, relative to the weight of the silicone resin, of an organometallic compound. In other words, the mould release agents according to this reference contain about 2 to 8 percent by weight of a partly alkoxylated silicone resin containing about 4 to 20 percent by weight-relative to the weight of the silicone resin-of an organometallic compound and about 70 to 98 per cent by weight relative to the total weight of the silicone resin and the organopolysiloxane, of an organopolysiloxane and optionally an organic solvent or dispersant. In the preparation of the silicone resins according to this reference, a mixture of organohalosilaries, for example, a mixture of methyltrichlorosilane, dimethyldichlorosilane and propyltrichlorosilane is hydrolysed and polymerised in the presence of water and methyl alcohol and in the presence of xylene at a temperature of about 24 to 80°C. The final product is a partially hydrolysed methyltrimethoxysilane, propyltrimethoxysilane and dimethyldimethoxysilane compound in xylene. A curing agent, for example, an organometallic compound is added to the silicone resin thus formed. Examples of suitable curing agents are lead octanoate, lead naphthenate, tin octanoate, dibutyltin diacetate, dibutyltin dilaurate, iron naphthenate, iron octanoate, cobalt octanoate, zinc naphthenate, zinc 2-ethylhexanoate and tetra-2-ethylhexyl titanate (tetraoctyl titanate). The liquid organopolysiloxanes which can be used are generally polysiloxanes containing terminal alkyl groups and having 1 to 18 carbon atoms which are bound to the silicon atom. Examples of suitable liquid organopolysiloxanes are those containing alkyl radicals such as methyl, ethyl, propyl, butyl, hexyl, octyl, decyl, dodecyl, tetradecyl, hexadecyl, octadecyl radicals and the like and also aryl radicals, for example phenyl and naphthyl radicals, or mixtures of such radicals. wherein x has a value of from 250 to 850, R is OH or CH3- and R' and R" are CH3-, wherein there is present in component (C), less than fifteen percent by weight of (CHg)3SiO units; and (D) from 0.48 to 6 parts by weight, based on 100 parts of (A), of a curing agent. The first component of this invention, component (A), the base siloxane is a hydroxy-functional polysiloxane resin copolymer containing CH3SiO3/2 units, C6H5SiO3/2 units, C6H5(CH3)SiO units and (C6Hs)2SiO units. It should be noted that this base siloxane contains no (CH3)2SiO units and further, this base siloxane must have from about 0.5 to 5 weight percent of hydroxy radicals which are attached to silicon atoms. Further, this base siloxane resin has an organic group to silicon ratio of from 0.8 to 1.4 and a C6Hs- to silicon ratio of from 0.35 to 0.85. This copolymer can be prepared by known commercial means such as, for example, by the hydrolysis and condensation of chloro- or alkoxy silanes. These base siloxanes are commercially available. It should be noted that upon condensation of the hydrolyzate, and subsequent catalytic bodying techniques known in the art, this base siloxane can be obtained essentially solvent-free and it is preferred for this invention that the base siloxane be utilized to form the composition of this invention in such a form. This allows the solids content of the final composition to be varied such that handling properties, economy in shipping the formulations and, the thickness of coatings on the substrates can be widely varied. If it is required that the base siloxane be used in solvent, the base siloxane can be easily dissolved in common organic solvents such as xylene, toluene, naphtha and the like. This component is generally used at 100 parts by weight in the composition. Component (B) of this invention, CH3SiO3/2, is a residual product derived from the alkoxysilane, CH3Si(OCH3)3. The alkoxysilane is added to the formula neat, as it is a low viscosity fluid material which helps solubilize some of the higher molecular weight components and helps the total composition to become homogeneous upon initial mixing. It is believed that the alkoxy silane, under the influence of the curing agent, component (D) (to be described infra), initially reacts with the hydroxyl groups of the base siloxane and the hydroxyl groups of the slip agent, component (C) (to be described infra), to form low molecular weight alkoxy-functional siloxanes which eventually react further to liberate methanol and form silanol groups which eventually condense to form high molecular weight materials and crosslinking sites which cure the composition. Component (B) is a common product of commerce and is readily available. For purposes of this invention, there is generally used from 4 to 240 parts by weight of component (B), for every 100 parts of component (A). It is preferred, however to use from 50 to 150 parts by weight of component (B) and it is most preferred to use 80 to 120 parts of component (B). wherein x has a value of from 250 to 850, R is an OH or CH3- radical and R' and R" are CHa- radicals, wherein there is present in component (C), less than fifteen percent by weight of (CH3)3SiO units. This component is the "slip" component of the composition, that is, this component is the ingredients in the formulation that is primarily responsible for the release characteristics of the cured coating. Component (C) is readily manufactured by well-known means by those skilled in the art. For purposes of this invention, "small amounts" means less than about 10 weight percent, based on the total weight of component (C) in the inventive composition. The value of x serves to indicate the approximate viscosity of the fluid siloxanes. Thus, preferred for this invention are fluid siloxanes having a viscosity of from 8 to 20 Pas (8,000 to 20,000 cps). Most preferred for this invention are fluid siloxanes having a viscosity of from 11 to 14 Pas (11,000 to 14,000 cps). Component (C) is used in this invention at 0.2 to 6 parts by weight, based on 100 parts of component (A). Most preferred is the use of the component (C) at 0.5 to 2 parts per 100 parts of component (A). The component (C) is generally utilized at 10 weight percent solids in a solvent such as toluene. The fourth component of this invention, component (D), the curing agent, is a silanol condensation catalyst. Preferred for this invention are titanate catalysts as they tend to promote the efficient reaction of the alkoxysilanes with the silanols of components (A) and (C) and, the titanates also tend to promote the condensation reaction between the silanols. Especially preferred are the titanate esters, tetraisopropyltitanate and tetrabutyltitanate. These catalysts are used neat, that is, they are generally used without solvent since they appear to be highly compatible with the components (A), (B) and (C). Component (D) is generally used in this invention, in the amount of 0.48 to 6 parts by weight, based on 100 parts of component (A). Most preferred for this invention is 1 to 3 parts of component (D). The titanate curing agents are commercially available. Optionally, solvents can be used with the inventive composition or the composition can be used at 100% solids. It is preferred that the compositions be used in a solvent solution for ease of handling, flow out properties and film thickness control. Generally, the compositions are present in the solvent at about 20 to 70 weight percent non-volatile materials. Preferred for this invention are the common organic solvents. Especially preferred are xylene, toluene, isobutylisobutyrate, naphtha and the like. Most especially preferred are toluene solutions containing about 40 weight percent non-volatiles. The method of preparation of the inventive composition is not critical. The four components (A), (B), (C) and (D) are mixed together and homogenized by stirring or shaking. When first mixed, the mixture is opaque to translucent in appearance but within a few minutes, the mixture starts to clear and within a short time, for example, 2 hours, the mixture is quite clear. It is ready for use as a coating at that time or the mixture can be stored at room temperature for several months. Sometimes, the first three components are thoroughly mixed until transparent and the curing agent, component (D), is added just before use. This method allows for enhanced shelf stability of the three component composition. The solvent, if used, can be added at any point in the preparation. If solvent is to be used, it is preferably added at the beginning of the preparation in order to facilitate the preparation. Components (A) through (D) are the essential ingredients of this invention but it is contemplated herein that aside from the use of solvents, there can also be included such optional ingredients such as pigments, metal flakes and powders, stabilizers, colorants, flow and film forming agents and the like. In use, the coating can be applied by any conventional coating technique such as spraying, dipping, brushing or by the use of a doctor blade. For this invention, spraying and dipping are preferred. Most preferred is a dipping technique, as spray coating tends to lead to somewhat softer cured coatings. The compositions of this invention can be applied to most surfaces without the use of a primer. For some applications, however, it may be desirable to use a primer. These coatings can be applied to most solid substrates but it is preferred for purposes of this invention, to coat metal substrates, especially metal bakeware and cookware such as steel, copper, aluminum, tin, magnesium and alloys of such metals. As far as is known by the inventors, these coatings can be used for almost any type of food such as baked goods, fried and broiled meats, vegetables, sauces and gravies. These compositions, when in the fluid form, are characterized by ease of preparations, shelf stability, handling characteristics and both room temperature and elevated heat curability. When coated and cured on a substrate, these cured coatings impart highly desirable release characteristics, they are hard coatings, they adhere to the substrate without the use of primers and they exhibit hot oil and hot and warm soap resistance so that clean-up of the coated articles is minimal. These materials are useful in the home but they find greater use in commercial cooking and baking applications. Now, so that those skilled in the art more clearly understand the invention, the following examples are presented. For purposes of these examples, the following applies. The metal panels used in these tests were purchased from the Q-Panel Company, Cleveland, Ohio, U.S.A.
Room temperature cures were at ambient conditions of 25°C. The slip material used in these formulations is a 10 weight percent solvent solution of a hydroxy endblocked polydimethylsiloxane of approximately 12 Pas (12,000 cps) which contains less than 15 percent by weight of trimethylsiloxy endblocking. Special Naphtholite is a solvent manufactured by Chemical Central, Chicago, Illinois, U.S.A. The following test procedures were used to evaluate the resin coatings. A pencil lead of known hardness (4B-softest to 9H-hardest) is sanded flat on the end. The end is then held at a 45° angle on the coating and pressed into the coating. Pencils of increasing hardness are used until the resin film is gouged. The pencil hardness recorded is that pencil number just prior to the one which breaks through the film. >9H means the hardest pencil did not break through the coating. (4B, 3B, 2B, B, H, 2H, 3H, 4H, 5H, 6H, 7H, 8H, 9H). A weight which is a cylindrical weight of approximately 85.g (3 oz.) is wrapped with 8 layers of cheesecloth and placed atop a panel that has been coated with the resin and cured. The panel is then inclined until the weight begins to slide. The angle of initial slipping is the slip angle. This indicates the release properties of the cured resin film. The coated panels are placed over a glass beaker of boiling deionized water for 15 minutes. Any whitening or adhesion loss is noted as failure. Wetting is a visual observation of the film for defects such as cratering or rivulets of resin. The coated panels are placed in a salt fog chamber for 100 hours, then observed for corrosion of the metal or adhesion loss of the resin. This test is used to test the degree of cure and integrity of the cured coating. The test is carried out by wrapping the peen end of a ballpeen hammer with 10 layers of cheesecloth and saturating the cheesecloth with methyl isobutyl ketone (MiBK). The hammer, with the cheesecloth contacting the coating, is rubbed across the coating, using only the weight of the hammerhead, until the resin coating is broken through to the bare metal. The number of back and forth rubs is recorded as the number of "double rubs" required to just break through the coating. This test is carried out by coating a metal substrate, curing the coating, and scratching through the coating with a sharp instrument to form a grid of 10 squares on each side of the grid. ScotchR brand (3M Company, Minneapolis, Minnesota, U.S.A) adhesive tape about 25.4 mm (1") wide is pressed sticky side down over the crosshatch with normal pressure. The tape is then sharply removed by pulling the tape away from the surface in a direction parallel to the surface. The number of small squares remaining on the surface is reported as the % adhesion. An average of these pulls is recorded. For purposes of this invention, "good" means greater than 90% of the squares remained after the tape pull. This sample was prepared by adding and mixing the ingredients in a 0.568 I (pint) glass bottle on a revolving wheel until the mixture was homogeneous. The mixture consisted of 80 gms (100 parts by weight) of a hydroxyfunctional polysiloxane resin having about five weight percent hydroxyl groups on silicon and consisting of CH3SiO3/2 units, C6H5SiO3/2 units, (C6H5)2SiO units and C6Hg(CH3)SiO units and having an organic group to silicon ratio of approximately 1.2 and a C6H5/Si ratio of 0.6; 120 gms (150 parts by weight) of NS 66/3 Special Naphtholite (VM & P naphtha of low aromatic content); 40 gms (50 parts by weight) of DowanolR EB (ethylene glycol mono butylether), manufactured by the Dow Chemical Company, Midland, Michigan, U.S.A.; 40 gms (50 parts by weight) of dry toluene and 1.64 gms (2.05 parts by weight) of a fluid polysiloxane as described above. Eighty gms of the above mixture (100 parts resin) was treated with CH3Si(OCH3)3 and tetraisopropyltitanate (tipt) according to the formulations in Table I. When cured, the properties shown on Table I were obtained. There was used 0.24 gms of tipt (0.75 parts) for each sample and the substrate was R-39 cold rolled steel purchased from the Q-Panel Co.
Several larger preparations of the compositions of Example 1 were prepared in essentially the same manner as in Example 1. Combined were 50 gms of the resin (100 parts), as described in Example 1, 88 gms (176 parts) of toluene, 56.6 gms (113.2 parts) of CH3Si(OCH3)3, 1.6 gms (3.2 parts) of the fluid polysiloxane as in Example 1 and 1.6 gms (3.2 parts) of tetraisopropyltitanate. These materials were revolved until homogeneous. This material was designated 2A. Sample 2B was the same except that 85 gms (170 parts) of CH3Si(OCH3)3 and 1.9 gms (3.8 parts) each of tipt and fluid siloxane were added and 2C was the same as 2A except that 113.3 gms (226.4 parts) of CH3Si(OCH3)3 and 2.1 gms (4.2 parts) each of tipt and fluid siloxane were added. The formulations can be found on Table II. The substrate was R-39 cold rolled steel panels purchased from the Q-Panel Company. This sample was prepared by adding and mixing the ingredients in a 0.568 I (pint) glass jar on a revolving wheel until the mixture was homogeneous. To the jar was added 160 gms of a polysiloxane resin having about five weight percent hydroxyl groups and consisting of CH3SiO3/2 units, C6H5SiO3/2 units, (C6H5)2SiO units and C6H5(CH3)SiO units and having an organic group to silicon ratio of approximately 1.2 and a C6H5/Si ratio of approximately 0.6; 50.6 gms of toluene; 96.8 gms of isobutylisobutyrate; 166.8 gms of Special Naphtholite 66/3 solvent; 6.4 gms of a slip material as described above and 325.9 gms of CH3Si(OCH3)3. This mixture when cured will provide a CH3SiO3/2 to resin ratio of 102/100. To this mixture was added 3.2 parts by weight of tetraisopropyl titanate as a curing agent. Into the mixture was then dipped two 76.2x228.6 mm (3"x9") aluminized steel panels and when removed, they were allowed to air dry for about 15 minutes. The coatings were then cured, one in an air circulating oven at 600°F for 6 minutes and the other at room temperature for two hours. The oven cured panel was designated 3A and had a pencil hardness greater than 9H and a methyl ethyl ketone (MEK) rub of 35 double strokes while the room temperature cured coating designated 3B had a pencil hardness of greater than 9H and the MEK rub was 8 double strokes. The 3A coating passed the steam stability test. When the coating prepared in Example 3 above was cured 6 minutes @ 316°C (600°F) without the addition of catalyst, the pencil hardness was greater than 9H but the coating failed to pass the steam stability test.
. When the coating prepared in Example 3 above was cured 6 minutes at 316°C (600°F) using p-toluenesulfonic acid instead of tetraisopropyltitanate, at the same level, as a curing agent, the coating did not cure. A mixture was prepared by adding to a 0.568 I (pint) jar 100 gms of the polysiloxane resin described in Example 1; 100 gms of CH3Si(OCH3)3; 135 gms of the solvents described in Example 1 (at the same ratios); and 2.68 gms of slip material. The mixture was capped and revolved on the wheel until homogeneous and then aliquots of the mixture were taken and treated with varying amounts of tetraisopropyltitanate catalyst according to Table III. The mixtures were coated on aluminized steel panels and cured at 316°C (600°F) for 6 minutes. The results are in Table IV. A large batch of the inventive resin was prepared (300 lbs.) in which the ratio of CH3SiO3/2 to resin was 1:1. Then the slip material was added to aliquots of the resin at 0.8 parts based on 100 parts of the resin and the catalyst was added to the aliquots after the aliquots were taken from the large batch and diluted to 40% solids in solvent consisting of toluene, Special Naphtholite and isobutylisobutyrate at a weight ratio of 17.5: 49.5: 33. The resins, after catalysis were used to dip coat two separate aluminized 76.2x228 mm (3"x9") steel panels. After dipping, the coatings were allowed to air dry for about 15 minutes. The coated panels were then cured at 316°C (600°F) for 6 minutes. 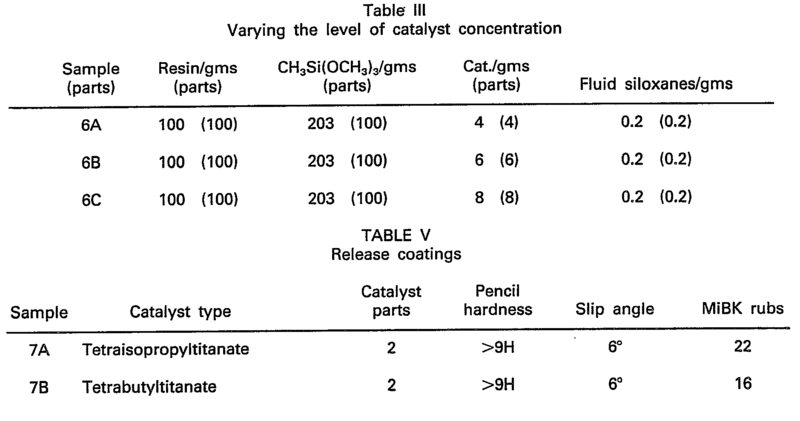 The formulations with catalysts and the results are shown in Table V.
These coatings had good crosshatch adhesion, hardness and excellent release. Two resin formulations were prepared by essentially the same method as Example 1. The formulations and testing results are shown in Table VI. The substrate was R-39 cold rolled steel. A formulation was prepared in which there was present 100 parts of resin of Example 1 and 100 parts of CH3SiO3/2. Sixty gms of this resin was added to 90 gms of solvent as described in Example 7, 0.5 gms of 10 weight percent fluid siloxane and 2.0 gms of tetraisopropyltitanate. 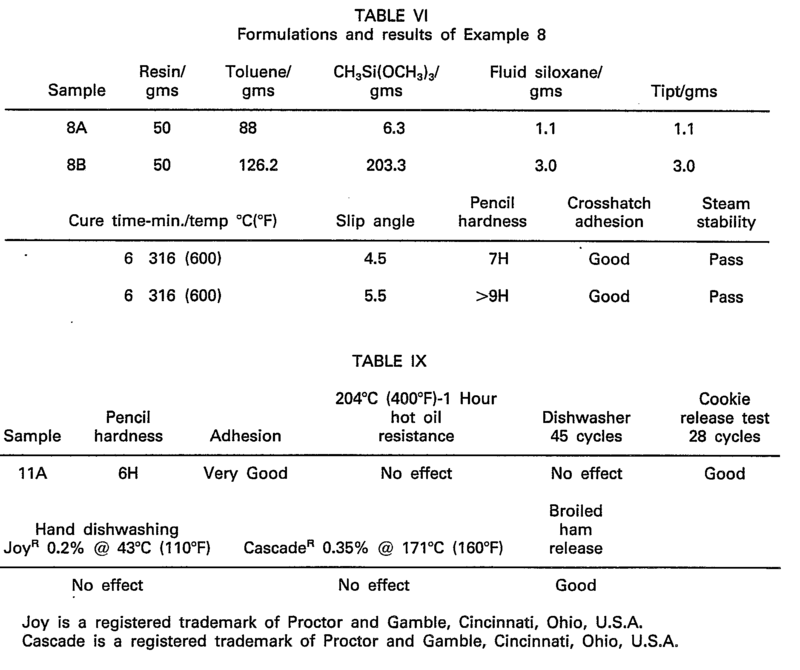 The formulation was coated on R-39 cold rolled steel and cured at a given time and various temperatures as shown in Table VII. The resin formulation prepared in Example 3 was tested after setting on the shelf for thirty days. The material was coated on a R-39 cold rolled steel panel and cured. The results can be found on Table VIII. Several tin plated steel bakeware units were coated with the resin prepared in Example 3. The bakeware was tested in multiple tests such as pencil hardness, adhesion, hot oil resistance, dishwasher, release, hand dishwashing, cure and broiling resistance, all of which are standard tests. When cured for 6 minutes at 316°C (600°F), the following results (Table IX) were observed. In general, the coating was smooth and had good gloss. This formulation was then placed in a one-quart ceramic ball jar along with various sized ceramic balls and ball-milled for about 16 hours on a roller. This treatment resulted in a black pigmented coating resin. This material was designated as 12A. A second material, prepared from the resin composition as used in sample 12A (230.8 gms) was treated with 90 gms of R-900 Ti02, manufactured by DuPont, Wilmington, Delaware, U.S.A. and 159.2 gms of toluene. This material was also ball milled for 16 hours to give a white coating. This material was designated 12B. When these materials were coated on aluminum panels, the following results were achieved. (See Table X). (D) from 0.48 to 6 parts by weight, based on 100 parts of (A), of a silanol condensation catalyst. 2. A composition as claimed in claim 1 wherein component (D) is a titanium ester. 3. A composition as claimed in claim 1 wherein there is also a solvent present. 4. A composition as claimed in claim 1 wherein there is also present a mixture of solvents. (ii) curing the coating, whereupon a solid substrate, having enhanced release, is obtained.